Final Day of the countdown to December 1st! Here is the last sneak peak before the December 1st stamp sets are available to buy! The ornament is attached to the top of the box....too cute! I'll be busy tonight getting the New Products Email ready and all the products ready to go! Talk to you soon! Why not create a card out of a gift bag? What would that be called? A Gift-e-lope! Isn't it cute! I thought of this idea over a year ago, so I thought it was about time I use it....what better time than when we are introducing gift stamps! Let's get started on our project! 1. Cut the bottom off of your small gift bag. I cut mine about 3/4 inch below the crease in the bag. 2. Fold the bottom of the bag up twice. 3. Stitch the bottom of the bag shut or close the bottom with double sided tape. 4. Embellish your bag as shown in the pictures, or create your own design. For mine I used a 5x5 square of SU Positively Pink, 4.75 x 4.75 of Green Galore, 4.5 x 4.5 of White, 4.25 x4.25 of SU positively pink. I stamped the Spot a Plenty on it with Versamark and embossed with white embossing powder. Cut a couple of scalloped circles, embellish as show, and you have your "envelope"! 4. Prepare a two 4 1/2 square cards. I used Spots a Plenty to make the background on white cardstock (4.25x4.25). You can either use a punch, or follow my bound button hole tutorial to create the button hole insert for your gift card. One of your cards will be solid and one of your cards will have an opening for a gift card if you would like. 5. Cut pieces of the white tissue paper in 5x5 pieces...I used 4 pieces. I stamped my tissue paper with the Spots a Plenty CD Stamp. Gather it as shown with your fingers. 6. Tape the tissues puffs as shown on the top of one card. 7. Line the second card up with the first card with tissue paper taped to it. Use double sided tape or stitch the pieces together. 8. Sew or tape a piece of ribbon on to the top of the card as a pull to get the card out. Give it a try! I think this card would be EXTREMELY cute with CD Stamps Monkey Surprise set! The Countdown Continues to December 1st! Don't forget to look at my blog candy and make a comment for a chance to win! Deadlines are listed in the post! Here's the link: Look at CD Stamps blog candy! Here are some more sneak peeks to get you ready for December 1st! These samples were done by one of my Senior Design Team members, Candy Fosta. She has been with me the longest and is just awesome! When she makes her 3D projects, many times, she gears them towards things my girls would like. When her box comes, I have to hide everything or my girls have it carried off and hidden before I know it! All the makings for an adorable snowman fit in the tin! How cute is that! Now I want snow! These tins can be found at Hobby Lobby and Michaels. Candy also designed this next sample using the December Stamp of the Month. This stamp of the month is 33% larger than previous stamps of the month...free with the same $50 order. You won't want to miss Cookie Creations (available December 1st)! This pouch opens up to reveal a cookie mix! The inside sentiment says: Here's a little extra dough for Christmas! This is a cd envelope! One more day until you can purchase these fantastic stamp sets! I don't know about you, but I am making the majority of my Christmas presents this year. What better way to make presents than with stamps! I'll be showing them to you as I get them completed! Don't forget, Clear Dollar Stamps does offer Gift Certificates! What better way to start the Holiday Season than with FREE STUFF! All of the new stamps being introduced on December 1st at CD Stamps! Participants with a US or Canada mailing address are eligible. Comments will close on Monday, December 1, 2008 at 9 AM. I will use Random.org random number generator to select a winner from the comments on Monday, December 1, 2008. I will post the winner no later than Tuesday morning, December 2. Good luck and thanks for entering my FIRST blog candy! Go to Clear Dollar Stamps now! I am so thankful for each and every one of you! Happy shopping! I hope everyone is having the pleasure of having turkey today...at least I consider it a pleasure.....think we'll get to sneak away for a few minutes of blissful stamping? Today you will see one of my favorites! Great for wrapping Christmas presents, Valentine's presents, and gifts for your kids....and more! See you tomorrow! Don't miss out on my first ever BLOG CANDY! I will also be announcing my sale for the weekend! Clear Dollar Stamps December 1st sneak peek! By December 1st, what do we HOPE we are doing? Wrapping some presents! Clear Dollar Stamps is here to help with that very thing. We have created wheels/stamps for you to cover paper or bags with and tags to match! Keep watching now through Sunday to see samples of what you will see on Monday when they release! Talk to you tomorrow to show you another wonderful sneak peek! Does anyone, besides me, remember creating chenille fabric jackets and blankets with plaid fabrics? I have been thinking about all of the sewing techniques I used to use and how I can apply them to my current love, paper crafting! So after a BUNCH of experimenting, I have come up with this awesome technique! 1. Create your background card. 2. Decide on the area you want covered by the chenille. My area is 3 7/8" tall and 1-1/2" wide (finished size of card is 4x4). Cut FIVE layers of mulberry paper to the area to be covered. Clip on to your background piece with paperclips or clips as shown above. 3.Stitch your first row of stitching 1/4 inch from the edge of the mulberry paper. 4. With a pencil, draw lines every 1/2 inch from the first stitching line. Stitch on each line. Once all the lines are stitched, make sure the amount of mulberry paper after the last stitching line is 1/4 inch. 5. With sharp pointed end scissors, carefully slide your scissors under all the layers of the mulberry paper and clip in the center of the two stitching lines. 6. This is what your project will look like when you have all the paper slit between the stitching lines. 7. Pick up both sides of the paper pinching it together. 8. Begin slitting your paper as shown. 9. When you have all your paper slitted, here is what it will look like. 10. Begin ruffling and scruffling (this is my made up word :-)) until you get the papers roughed up and fluffy as shown in picture 11. You now know how to create Paper Chenille! 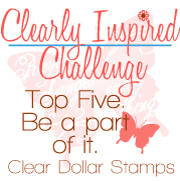 I would love to see any projects that you come up with using Clear Dollar Stamps and Paper Chenille! We could even start a special gallery for them! 1. Set up your Nestibilities ovals as shown....these are 4 sizes apart. I made sure Gigi fit in the smallest one. I put a piece of double sided tape on my C plate to hold them in place. 2. The sandwich goes like this for your Cuttlebug plates: A, C, Nestie ridge side up, 5 sheets mulberry paper, white cardstock (I used the center piece from this to stamp Gigi on), B plate. 3 You will be using the outer circle of mulberry paper. 4. Create your background for your card. 5. Place your shaped mulberry paper on your background paper where you would like to create the chenille. Stitch 1/4 inch from the edge of the inside. 6. Stitch 1/4 inch from the outside edge of mulberry paper. This may vary with the size of cut out you make. 7. VERY CAREFULLY, insert your pointed edge scissors through all the layers of mulberry and start cutting down the middle of the oval between stitches. 8. This is what it will look like when you are ready to start slitting your paper. 9. Go around all the edges of the oval making little slits. Start scruffling it until it is the fluffiness you would like! Isn't Gigi perfect in this little ring of ruffles! What do you give a father that has everything? The stamp set used on this card is Everyday Encouragements. The fiber is Pinecone Jute. I will be making a bound buttonhole to form my closure. 1. I made a 1 in button hole. Draw button hole on your project where you would like it. 1" x 3/4". Draw lines at a diagonal and cut on the diagonal lines with your exacto knife. 2. With a ruler and stylus score your rectangle lines. I laid mine on my mouse pad to score. 3. Fold your flaps in on lines. 4. Front view of card with flaps folded in. 5. Tape flaps down on back of project. 6. Cut two pieces of your designer paper 1 1/2 x 1 1/4 inches. 7. Draw a line on the center of your hole. This will be your alignment guide to get your two pieces lined up in your hole. Tape your two small pieces of designer paper over the hole with the folded edges touching in the center. 8. Front view....check to make sure they are centered. 9. Sew around the edge of your rectangle and you have a bound button hole! 1. Figure out what size cardstock you need to fit around your pouch of whatever. Center and create a bound buttonhole in cardstock. Score lines on either side of your pouch so it folds nicely. 2. Insert your ribbon into the bound buttonhole from the inside to the outside. 3. Lay your pouch on top of the ribbon and loop over the top side. Apply two sided tape as shown. Fold cardstock around the pouch and seal. 4. Push the pouch out about 2 inches and slide any slit punch that you have that fits your ribbon size...or cut slit with your x-acto knife. 5. Loop ribbon through slit. 6. Set your pouch upright and get everything lined up....tie a knot or bow at the top. 7. You have a slider pouch! I am now done just in time to go to O.D. 's (Old Dad) birthday party! My second post.....woo-hoo! A blog is a wonderful excuse to force myself to make time to stamp! I did another nugget set for this week.....I mixed a couple of techniques in with it to keep it interesting! Next week I am working on some new sewing techniques I'm really excited about! I am working on a schedule of what days of the week will be techniques, blog challenges, and our favorite....BLOG CANDY! As soon as that is decided I will post the schedule so you know when to check back! Isn't Rodney adorable on top of a little nugget and gift card? Punches: Martha Stewart snowflake punch....purchased at Walmart! The most frequently asked question I get is "how is that colored" and "what did your DT use to color the picture".....so here is how I colored! Step 2: Color in with the center with the Medium Brown (I used E35) blending it into the dark brown on the edges. Step 3: Last, take the Light Brown (I used E31) and color the center of his face and body....it just gives him a little more shading, as you can see in the last picture. As you are coloring these three colors together, it "pushes" the ink outward, which may cause it to bleed outside of the lines. If this happens, use your blender pen to erase unwanted ink! 1. Color around Rodney in blue....trim Rodney out as shown. 2. Take your first layer CS and color edges with copic blender pen and then over that with your blue copic. The center won't be seen, so don't waste your ink! 3. Sew the blue and the second layer red cs together with green thread. 4. Glue this layer on to card and then put dimensional foam pieces on the back of Rodney and attach to card as shown. 5. Color piece of cardstock with blue copic. Punch out a small circle...this one was 1/2 inch. Punch a hole in the center for the brad to go through. Clip the circle as shown. 6. Punch out snowflake and adhere over Rodney as shown with a dimensional foam piece. Put Brad through the middle of the blue circle in step 5 and attach on top of snowflake with glue dot. 7. Now for the fun part! Take your Star Dust Stickles and coat your snowflake with it....I also did Rodney's tail....because I have no flock! Take your Red Stickles and give him a nose! 3. Punch out snowflake and apply to nugget with glue dot. 4. Stamp Rodney and color as shown above. Cut out head only and apply with glue dot. 5. Add a little Stickles for his nose and you are done! 6. If you wish to put them in a nugget box as shown, you can make the blue nugget covers that same as the green ones sampled above. I hope everyone enjoys this tutorial.....talk to you next week!